You may be able to deduct some medical insurance premiums. 1. Can the Self-Employed Have HSA & Insurance Premium Deductions? 3. Can You Write off a Doctor's Copay on Your Taxes? A high-deductible health insurance plan with an associated Health Savings Account (HSA) lets you take advantage of lower premiums and stash away pretax dollars to pay your deductible or health and dental expenses that aren't covered by medical insurance. Internal Revenue Service rules allow you to deduct the money you put in your HSA account from your taxable income. You may also be able to deduct all or part of your health insurance premiums. Each year, you can contribute up to $3,100 for an individual to an HSA, or $6,250 for a family. If you're 55 or older, you can contribute an additional $1,000 a year. You don't have to pay taxes on the money you contribute to your HSA, so the IRS allows you to deduct the amount of your contribution from your gross income. HSA contributions directly reduce your taxable income. You can use the money in an HSA to pay medical bills but not to pay health insurance premiums. If you're self-employed and you made a profit during the year, you can deduct health insurance premiums you pay to cover yourself, your spouse and your dependents. Take this deduction on line 29 of Form 1040. As with the HSA contribution deduction, the health insurance premium deduction reduces your taxable income. If you're eligible for health insurance coverage under an employer's subsidized plan or under your spouse's employer's plan, you can't deduct your health insurance premiums as a self-employed person. If you realize a loss, you can't deduct your health insurance premiums. If you itemize deductions, you can't include self-employed health insurance premiums in your medical expense deduction. Even if you're not self-employed, you may be able to deduct the insurance premiums you pay as medical expenses. You can only deduct medical expenses if you itemize deductions, and you can only deduct the amount of your medical expenses that are more than 7.5 percent of your adjusted gross income. 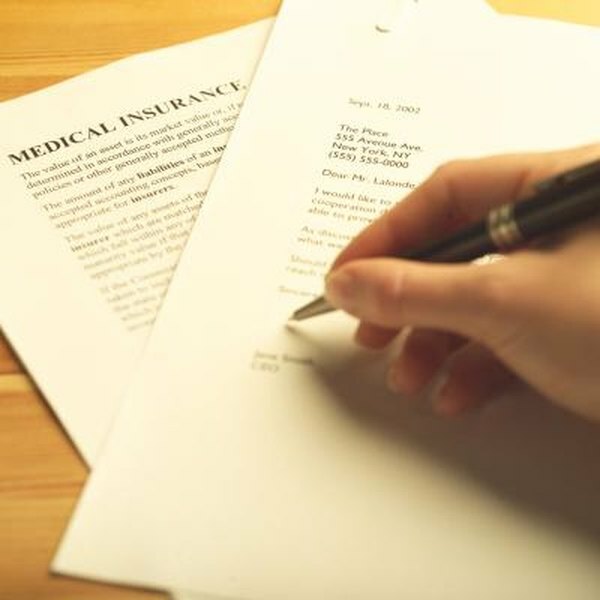 You can include medical insurance premiums with other expenses such as non-covered medical bills, eyeglasses or dental bills, as long as you didn't use money from your HSA to pay these bills and as long as the bills weren't reimbursed by your employer or your health insurance company. This deduction reduces the amount of tax you pay but doesn't reduce your taxable income.